It is related that early one morning many years ago, while still living in Iran, Dr. Javad Nurbakhsh, Master of the Nimatullahi Sufi Order, awoke and told his dervishes that he would be traveling to another khaniqah across the country, and that all who wanted to accompany him should be ready to depart in an hour. Urgent calls were made and every car that was available from any source was soon filled with darvishes. They formed a long caravan on the highway, driving through the morning. The Master sat in the passenger’s seat of the first car, and after a few hours, they were traveling through the desert part of Iran. Suddenly the Master commanded the car to pull over. The driver stopped by the side of the road, and all the cars behind them pulled over also. The Master got out and motioned for everyone else to stay by their cars. After an hour, he looked in the distance across the sands, but nothing could be seen. Master shaded his eyes with his hand, and after a while there appeared a figure in the distance, walking slowly towards the highway. When the figure came closer, it could be seen that it was a boy, perhaps twelve years old, and Master called him over. “Your father is sick,” the Master said. “I am a doctor. Here, take this to the pharmacy in the nearby town,” the Master said, and he wrote a prescription on a pad he took out of his pocket. The young boy thanked the Master profusely and hurried on his way. The dervishes were astounded. The younger ones whispered questions to each other. The older ones knew better and remained silent. Dr. Javad Nurbakhsh was a practicing psychiatrist, having both a medical degree and a PhD in psychology. He joined the Beloved in October of 2008, after having been Master of the Nimatullahi Sufi Order for fifty-five years. Possible Dreams and a Soaring Impulse! “Yesterday I had the privilege of speaking to a group of young Muslim children about the AIDS orphans of Swaziland and making a difference. Also, you can go to the Possible Dreams International website and read of his work, and if you scroll all the way down you will find a donate button through Paypal. Please help as you can. It doesn’t matter how much you give. Every dollar can save a life in Swaziland. “He who takes care of an orphan, whether he is his relative or a stranger, will be in Jannah (paradise) with me… “ – a hadith of the Prophet (pbuh), reported by Abu Hurairah. 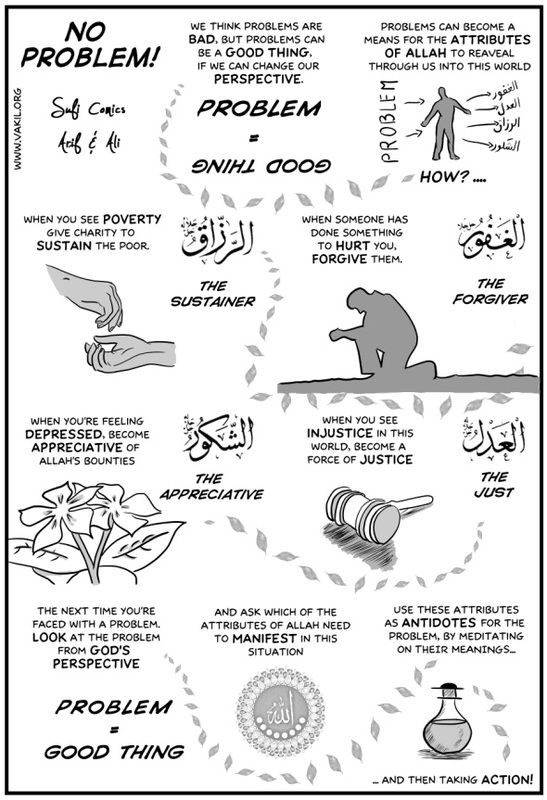 Note: The spiritual cartoon is taken, with permission, from Arif and Ali’s blog. You are currently browsing the Darvish blog archives for May, 2010.